This past weekend, there was a parent-student program at NHL’s Hebrew school. We first spoke about the challenges and best techniques to teach our kids to be thankful. Most kids today are lucky enough that their main problems involve what toys they get for birthdays/holidays or whether or not they have the latest versions of the most popular electronic gadgets. Travel to a different country, however, and a kid might be worrying more about whether his latest meal will be today or tomorrow or whether his parents will be able to pay the doctors to treat his sick baby brother. Compared to those concerns, getting the latest iPhone seems pretty petty. Sadly, the culture we live in is defined by consume-consume-consume. I wish I could say my boys are immune to it, but they aren’t. They have plenty of toys (some days it seems like too many toys – especially when they don’t clean up) and yet they constantly want more. We can’t exit any store without JSL asking for a new toy for him to open right now. The fact we never give in to these new toy cries doesn’t seem to deter JSL. One parent mentioned having toys “disappear” only to reappear months later. We’ve used this cycle in and out strategy before. Perhaps we should employ it a bit more. Later on, NHL and his class came into the room. We got to decorate a sheet and write in what NHL was thankful for. This is what NHL wrote down for what he was thankful for. 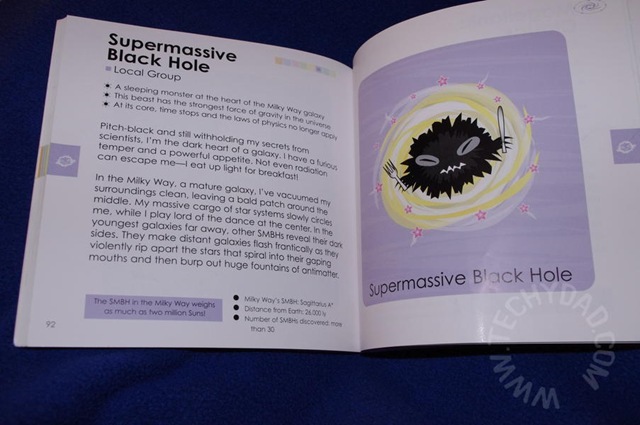 This book lists scientifically accurate information about the objects in our universe. From the planets to black holes, from the Hubble Space telescope to space-time. Of course, the facts are simplified for kids and the illustrations are made to be fun to look at. 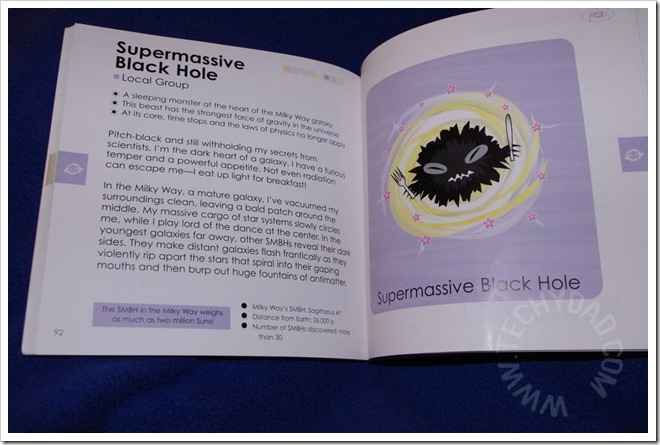 Still, NHL has taken to this book and the page on supermassive black holes in particular. It’s quite fun to watch him weave science and math into what seems to be otherwise unrelated projects. He’s really got the mind of a junior scientist and I’m going to love teaching him more and more about the world (and universe) around us.